American Experience - "Greely Expedition"
“Greely Expedition” debuts tonight as a part of PBS’ American Experience series. It will air at 9 p.m. Eastern and Pacific/8 p.m. Central and Mountain in most markets. Check local listings. How has there not been a successful series just presenting stories of the era of exploration, the times when humanity was pushing to make sure all edges of the planet were mapped and visited thoroughly. Now that we know where everything is, the world retains so much less of its mystery, and going back even 100 years into our past is a good way to make that mystery snap back into place, to make it seem as if Earth could contain wonders, not just the same seven continents and a handful of islands. Perversely, perhaps the only palatable thing about global warming is that it might restore this sense of possibility. Greenland might be three islands, you say? Well, let’s melt that icecap and find out, coastlines be damned! “Greely Expedition,” the latest largely enjoyable installment of PBS’ history-based series, American Experience, takes place in that era of exploration, specifically among the subset of explorers who pushed toward the poles, despite all evidence that this was a potentially life-ending idea. Led by Adolphus Greely, the expedition encountered trouble when it became apparent that the ships meant to bear the men back to civilization would not arrive, leaving Greely and his men stranded at the far-north point of Fort Conger, a desperately remote location that was miserable to live at, but one that the men could actually live at (what with the ample amount of wild game around the fort). 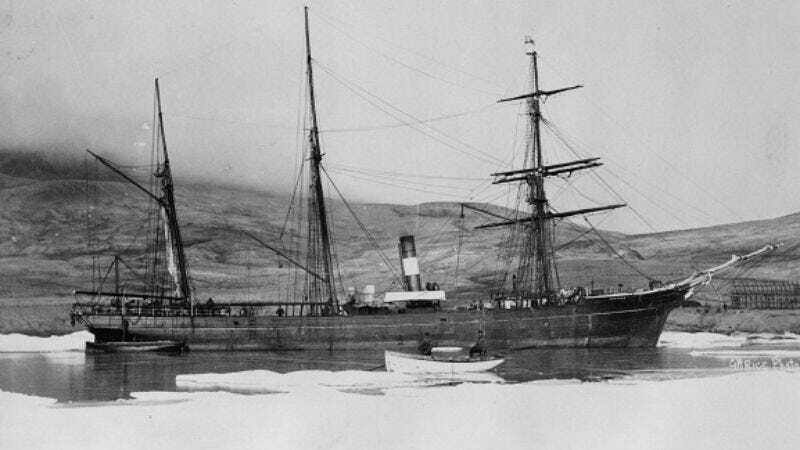 Greely, for whatever reason, decided to leave the fort, embarking on a suicide mission to get back to home first via steamboat, then via ice floe. That he was eventually rescued and returned (by his wife, no less) is a remarkable miracle, the fine line between bravery and stupidity. If there’s a problem with “Greely,” it’s a problem that lots of American Experience segments have. The thing is just too short. When Greely’s wife’s rescue party happens upon the few men left alive from the expedition (including her husband), it just sorta … happens. (And the segment lets you know upfront that Greely lives and was saved by his wife, so I’m spoiling nothing, even if you don’t know the history.) Even an extra half hour here could have paralleled the efforts of the expedition to get back to civilization with the efforts to find the expedition more effectively, instead of the incredibly abrupt rescue we get here. Similarly, a longer running time would have given greater time to get into many of the intriguing substories here, like the argument over whether to abandon Fort Conger or the story of two men who go off into the snow in search of food and have to make an agonizing choice. For all of the episode’s strengths (and there are many), the whole thing feels curiously rushed, trying to squeeze everything into the series’ one-hour running time. Still what’s good here is good enough to make this worth recommending. In particular, the episode’s evocations of the emptiness of the Arctic landscape are terrific. It’s one thing to hear about all of this; it’s quite another to see it, and I’m glad the special edits in copious footage of endless, snowy wastelands, unmarked by anything remotely human. Similarly, the episode stitches in several compelling portraits of the men in the expedition, what made them join the group, and what they hoped to gain by heading northward, and it continues American Experience’s occasional dabbles into the idea of America’s aggressive ambition, this time wanting to have the man who’d traveled the furthest north, breaking a centuries old record held by the British just because. But the greatest strength here is that, like “Dinosaur Wars” a couple of weeks ago, this story just isn’t that widely known. Those who are greatly interested in the period of polar exploration are going to know Greely’s story and the unusual legacy of the scientific data he protected at all costs, even when all around him were dying of hunger. But most viewers are going to be largely unfamiliar with the struggles of the expedition, and the unfamiliarity of the story often means that all the episode has to do is get out of the way of it and let the unusual setting and vibrant characters do all the “work.” It’s all the better for being true and for having a rich sense of what it must have been like to be at Fort Conger, surrounded in all directions by nothing at all, wondering if your leader has lost his mind for insisting that all involved try against all odds to get back to the Newfoundland port you left from. It’s interesting stuff, even if it flies by too quickly at times. Which brings me back to the point at the start. The age of exploration is one of those great human stories, a tale of people seeing something that needed to be done and then doing it, even if it meant the end of their lives. There are so many great small stories that haven’t been widely told from this era that a whole series about that time in history would make a kind of sense. Heck, within “Greely Expedition” itself, there’s room for something like five or six other episodes, if the producers really wanted to make that so. There’s just something incredible about not knowing what’s over the next ridge but knowing you need to find out.